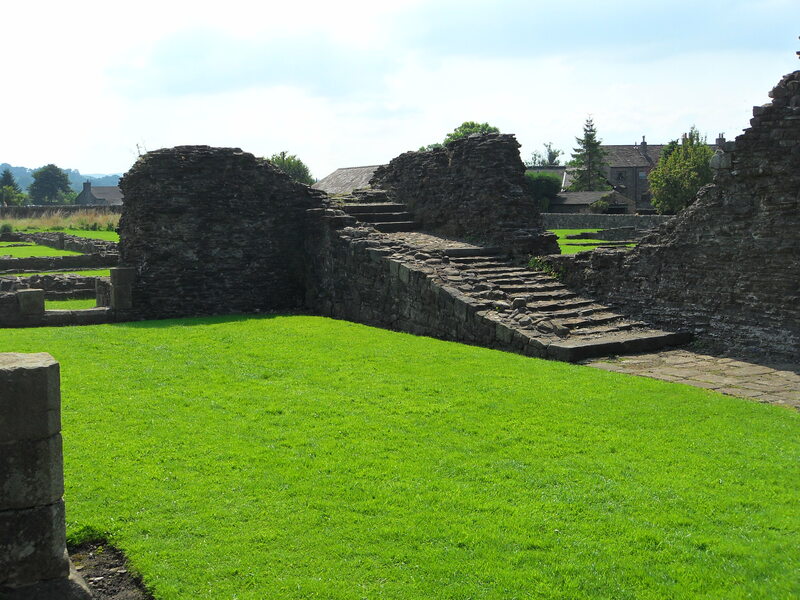 Sawley Abbey was founded in 1146, by monks from Newminster Abbey near Morpeth, Northumberland. The land was donated by the powerful Percy family, who went on to give more land in 1280 due to the monks complaining about the marshy ground and poor weather the site endured. In 1296 when nearby Whalley Abbey was founded, the two houses fell out immediately over rights to the local resources. As you enter the abbey have a look at the layout on the notice board. There’s not a lot of interpretation on the site, and you may want to look at this again, before you leave. In front of you, you can see the large standing walls of the abbey church. The building is unusual, in that the nave, normally the largest part of a church,is very small. Normally it would extend right down to the end of the cloisters (which can be seen as the large grassy square), but such was the poverty of the monks it was never completed. Pass through the nave and head into the central ‘cross’ of the church. Here you can see a number of interesting features. The small rooms before you would have been chapels, and we can still see the medieval floor tiles in place on the ground. To your right is the night stair, which the monks would have come down from their dormitory in the night to carry out their religious services. Head into the choir (where you can see the base of the pillars) and then look out into the field beyond. The abbey clearly extended into this field, as you can see many straight earthworks. Head back now to your right to explore the rest of the site. An impressive stone line drain complete with arches can be seen. This would have served the reredorter, or toilet block. The foundations of the chapter house, vestry, refectory and kitchens can all be seen but the walls are all long gone. In 1537 the abbey was dissolved. The abbots lodging was converted into a cottage and the fireplaces and ovens which can still be seen today, were installed then. 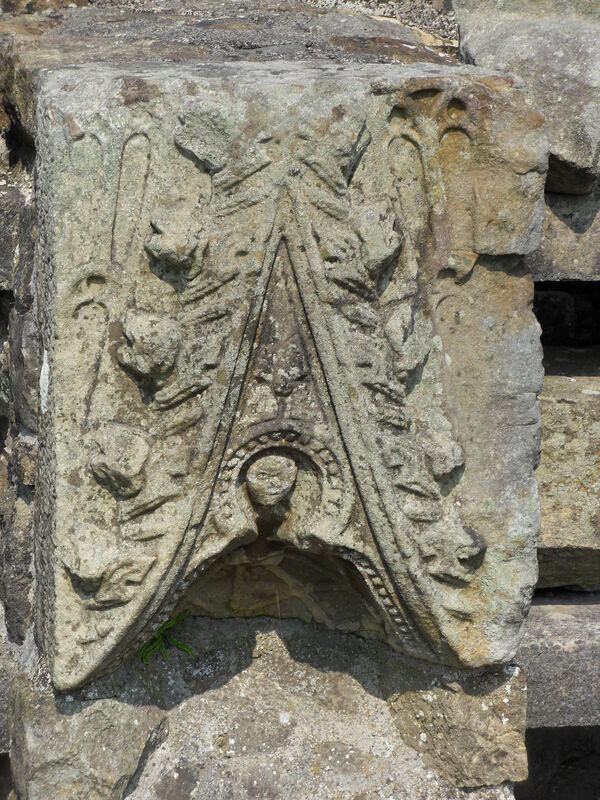 Much of the stonework of the abbey was used in the buildings around the village and some of the more ornate pieces can easily be identified, for example in the house adjoining the abbey and on the main road. Before you leave the site, have a look at all the different stone carvings lined up on the large stone shelves just inside the entrance to the site. There are many intricate and intriguing features, such as the one pictured on the right.Don’t miss the large folly arch outside the abbey by the farmer’s field, it too has many interesting carvings that would have originated in the abbey. 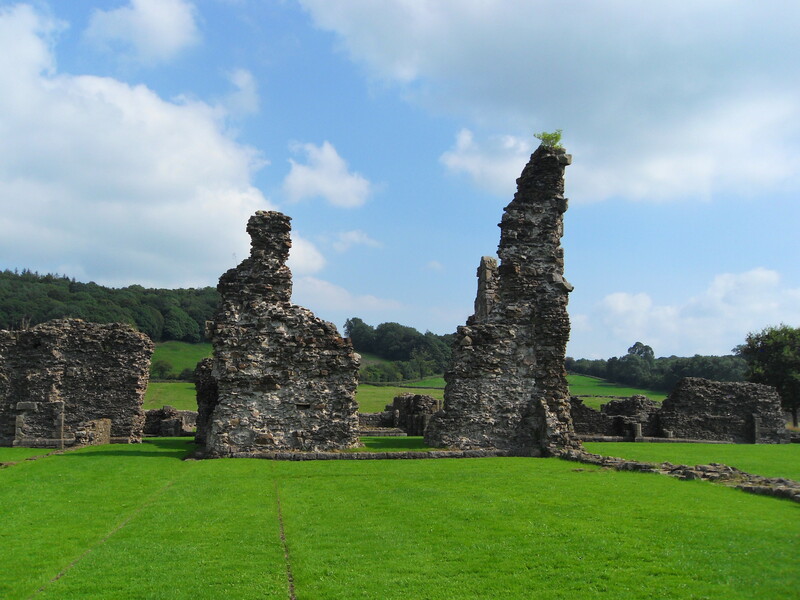 Access: Sawley Abbey is owned by English Heritage and is a free site to visit, open during daylight hours, every day. Parking: This is available on the road that runs alongside the abbey, or park in the village hall car park.